Professions have been in WoW since the start of the game and the system which they’re based on – gather things to make an item, perhaps gaining a skill up in the process, thus being able to make more complex things – hasn’t really changed that much over WoW’s history. Of late I’ve been pondering if professions should be removed from WoW. 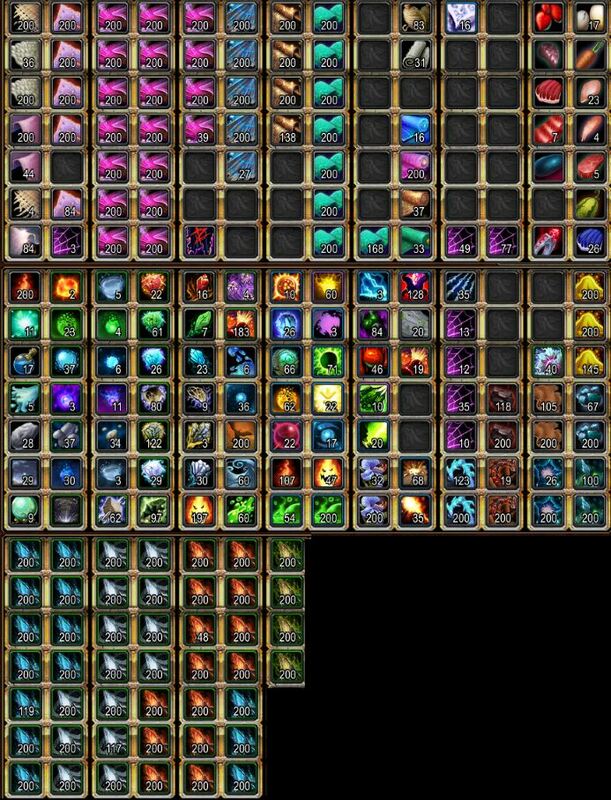 This is possibly a surprise for some – I’m a professions packrat, trying to be a completionist with recipes and having every profession maxed out. And alts would always have professions. But now? New alts don’t have professions, not even gathering ones. And there if there was a way to remove professions from some of my alts? I’d jump at the chance. The changes professions saw in Legion haven’t helped, but that just crystalized my thinking. So, what have professions done for us? When WoW was released professions made a lot of sense; it added depth to the world. And it was another way to improve your character – be it with crafted items, enchantments, potions or food. And, once players on your server were raiding, it became a good way to make gold. Every raider needed their potions. And elixirs. And their food. This meant alchemy could be a very profitable. As did cooking. Along with fishing. Often raid teams would have people dedicated to gathering the materials for raids. In my raid team we formed fishing groups, with different people fishing up different things – I spent many an hour fishing up Nightfins for mana regen food outside of Strat. Some of the recipes could be tricky to get, but in a good way; the following is a good example of the depth having professions can give. In Vanilla, the best mana potion came from the Major Mana Potion – and my priest had a major habit! The recipe came from a vendor, who just happened to be a ghost in Caer Darrow. But, you couldn’t see him until you’d obtained a Spectral Essence trinket after a long quest line. That let you see the ghosts and thus buy the recipe. It was also my first “Oh, darn” moment in the game when you realized the ghosts thought they were still alive and were going around their daily business. But were dead. Thus, professions led to me to a quest line not many did as it was long and involved multiple dungeon runs. It was also what I’d consider a “Nice to have” recipe. You didn’t need it for raiding – given the Superior Mana Potion gave just a little less mana and you could chug a potion every 2 minutes rather than only once in combat as happens now – but it was handy. That extra mana could allow you to cast another heal and keep someone alive! But, it was optional. You didn’t have to obtain it. The professions in Vanilla were relatively complex. They had 300 skill points to earn and there were quite a few different types of materials. There are lots of herbs, ores, leathers, dusts, shards, elements, essences, etc. That seems like a lot, and it is, but compared to vanilla crafting materials its fairly simple! Now, after we’ve had six expansions, the skill cap for professions is at 800 and we have a vast number of recipes. And a sea of materials. Looking over the guild bank of my storage char shows this! End result? There is a high level of complexity in the professions. It also discouraged new players from starting professions – moreso when you think that recent expansions have given you a character boost to the level cap of the previous expansion. Each expansion adds its own set of materials you have to gather. And new sets of skill points to earn. Its probably the main reason why I’ve given up on professions on new alts – its just too much work to get the 800 points required. I guess this is one reason why they’ve changed how professions work in Battle for Azeroth. You have a per-expansion skill level and you can start to make an expansion’s recipes right away – you don’t have to level up 800 skill points to start to make the recipes for the new expansion. This, however, does raise the issue with professions over Warlords and Legion. The garrison in Warlords almost made gathering professions redundant – you could gather the ore and herbs required using the mine and herb garden. That, combined with how easy it is to buy profession materials using garrison resources, meant it was trivial to level up tradeskills on alts. Yes, you had to run work orders for the BoP crafting materials, but they just took time and you got rush work orders to complete a number of work orders right away. Its sufficently trivial to get the garrison resources to run these and buy the materials that I’ve got my tailors making Hexweave bags with minimal efforts. It also means they return to their garrison every few days which means I’m also running garrison missions for the resources and rare missions which can be turned in to gold – I’m looking at Medallion of the Legion here. Even in Battle for Azeroth we only have 32 slot bags. And they look like they’ll need significant effort to make – requiring items from dungeons. Given the extra effort for just 2 extra slots, is there any reason to make anything other than the 30 slot hexweave bags I can turn out at one at nothing other than a low time cost every 2-3 days per tailor? And then we had Legion. They changed up professions in Legion, adding ranks to recipes and also questing. And, unlike with Vanilla, the questing here was required. And it involved dungeons, often on heroic. And for some professions – like alchemy – you had to discover new recipes. Whilst this seems great on paper, when you’re making lots and lots of flasks to proc a rank 3 recipe so you can actually gain more skill points? Doesn’t feel so good at all. As a result of this, almost all of my chars have leveled their tradeskills using the Darkmoon Faire – for almost the entire expansion. I can see what they tried to do here – add some story to professions. Make them more engaging. But, at least for me, they backfired in a big way. I’ve ended up not really liking professions – I’m not a fan of gating mechanics. The fantasy of crafting – gathering precious materials, skillfully adjusting them and making something awesome – is very hard to get right. This video – which made the rounds on Twitter & I think is from the Make N’ Create YouTube channel – sums up how crafting actually feels in game. See that YouTube channel for the actual work required! So, what have professions really done for us? Well, anything which gives us a boost to our character could be removed from the game – after all, they can just adjust fights to account for that. That means all potions, flasks, enchants and foods can go. That only leaves crafted gear. Blizzard have had an issue with end game crafted gear – make it too easy to get and people will not raid for gear. Or are overpowered in raids and don’t need to kill bosses to improve their character. They’ve tried various ways before. We’ve had patterns for raid level gear only drop in raids – The Burning Crusade, with its BoP and BoE patterns, introduced that. And in the Black Temple you needed those patterns for resistance gear. They’ve also tried upgradable gear in both Warlords and Legion. Upgradable gear sort of worked, at the start of the expansion at least. However in Legion, with an ilvl cap of 900 which is below what you can get from LFR and BoA tokens giving 880 gear trivially? No need for it. The same thing happened in Warlords. So, we can discount crafted gear for improving the power of players. The only real thing left is transmog – there are lots of quite nice looking items which form transmog sets. But, if we were to drop professions completely, you could just put those on a vendor. Or, in line with the grindtastic design they seem to be going down now, have them as rare drops in dungeons from the relevent expansion. When WoW launched, it needed the additional depth the professions brought to the table. It added things to the world. Gave people a reason to use the auction house and interact with other players. But now, many expansions later, WoW is an incredibly complex game. Each expansion adds more to discover. More to do. And I’d argue that its time to just stay good bye to professions; their time has been. And gone. This entry was posted in Professions. Bookmark the permalink. 6 Responses to Time to bid farewell to professions? Great summary, Sivation. And what a trip down memory lane :) I can still recall some potions had to be made in Scholomance too, right!? Aww, that Spectral Essence…I still have that trinket on my old main. I could never get rid of that. It was magical times, where every little bit helped, every single +1 in a stat. I am afraid you are right. Those days are long gone. That crafting an Iron Dagger is very spot on now. Sadly. Though I guess I am one of few, who have enjoyed the profession quests in Legion; I feel they added to the immersion and fantasy. But I know many found them a drag. I’d probably view professions in Legion differently if I had fewer or no alts! Alchemy, as a one off, was fun. It was then repeated for every tradeskill and it wasn’t optional. Ah yes. That I agree with. It could feel a little uphill. I’ve always felt that crafting is one of the things that made WoW unique. Here the user base is able to make things and sell them to other players in the game. Many, many years ago, I came from FPS games background where the vendors were the only people selling items. If you wanted a new gun or better armor, you had to buy it off the vendor, or wait for it to drop. When my friend told me I could go fishing and cook the fish for healing, it actually sold me to play the game. I managed to level up my druid a few levels simply by flying around and collecting items back in the day. My alchemist is still transmutation master specialization that he acquired during BC. At one point this was an awesome gold maker as I could randomly proc an extra gem during transmutes. Since BC it’s been less of a perk returning only 1:1 transmutes. All those dungeons and materials required to switch from potions to xmutes.. :) Then to only be able to craft certain potions at the little desk in Shattrath. Having spun up a brand new paladin this expansion and start leveling my professions at 0, the changes to the professions were welcome. I dreaded having to go back to old world content to mine old nodes in prior expansions. Caused my gathering professions to stagnant. Being able to mine a legion node at 0, or craft a legion recipe at 0 was nice. I am still not maxed out in mining, but she is at max level blacksmithing. The only reason she made it to max skill level was to craft the legendary item (see http://www.wow-professions.com) and that was using WoD recipes up to 750. The Blacksmithing has been my favorite Legion crafting story so far. It’s ranged from gathering mats from all over the place and using complex methods to make single pieces of armor (forge, pound, purify, cleanse, shape, now you have a perfect demonsteel chest..).. Only once you’d completed the task once, did it become as simple as in the video (gather mats and take to forge). Engineering has been a lot of fun, end game. Combine silly things like ‘gun shoes’ with crazy useful items like the failure detection module, it’s an interesting profession. By moving these items to a vendor would create a bit of a gold-sink, or you’d have people simply give up on enchants, gemming and or food/flask buffs. I would have loved to see crafting improve over the course of an expansion. If I am going to work on level 3 of a recipe, it should have procced higher; not just be slightly cheaper to make ([mark of the distant soldier] I am looking at you). Maybe proc a higher ilevel, better stats or even another second/third stat (like leech). (Maybe I just didn’t craft enough items to see this). The Obliteratium forge was ridiculous. It was too expensive to open up (at least for me without an army of alts) AND when it was ‘free’ to use, it was too late (yeah! I can burn 10 crafted items to make a single piece of 880 gear!! when I’m already ilevel 880). – Deconstruct armor back into raw metals. – Remove expensive gems from armor so they can be reused (with minor stat loss for damage). – Recolor items (paint/dye) within a specific range. I’ve made good money from blacksmithing by crafting the Steelbound Devourer – I’ve sold a few & kept a number for after the expansion is over. The recipe comes from Tichondrius in Nighthold normal or above so there aren’t as many people who have it – keeping prices up. I’ve sold one or two of the legendary crafted bits – they’re handy for alts as they can be used from level 102 – but the work required seemed to be excessive. That a number of professions have had their own mounts which can be used accountwide – not just by those who have the tradeskill – is a nice thing for professions this expansion. I think if I was only doing a single profession it would’ve been ok – some good story & some work. Doing all the tradeskills to max, multiple times? Burnout time! Well, professions are still fun as a thing to do :) I like the process of making useful things out of world drop – wouldn’ it be boring if we got just vendor trash from mobs? Gathering is a sort of treasure seeking which also adds up for the excitement of open world exploration. I also liked the questlines which enhance the whole experience. I hated the dungeon gating behind them in Legion. But if you could do the whole questline for a new alt in an evening – just by going here and there in the open world – I wouldn’t say no to that. The quests themselves were quite engaging. One more thing that should be canceled is the stars recipe rating – its random just kills perfectionists like myself.